1991 Nov The Medical Information Center for foreigners opens. JVC Yamagata (Japan International Volunteer Center of Yamagata) is launched. The Okura Japanese Language Classroom Cooperative Project begins (ends in 1995). 1992 Japanese language classes are established (Kaminoyama, Murayama, Ooe). 1993 Jun The Shirataka Japanese Language School opens. Jul Support begins for operation of the 4th Social Welfare Center in Cambodia is launched. 1995 Jan Aid activities are conducted for the Great Hanshin-Awaji Earthquake victims. Jun Mental health support begins for Filipino citizens returning home (ends March 2000). 1996 Jan Awarded “3P Peace” from Yamagata Newspaper. The “Earth Stage” begins (ends on March 2002). Mar The Asian Family Conference is held. The Koh Island Project to Support Independence in Cambodia begins (ends December 2002). Nov The 1st Ethnipic (multicultural sports meeting) is held (ends June 1998). 1997 Feb Awarded “Japan Foundation Regional Exchange Promotion”. 1998 Jan Training of pre-departure for Philippine begins (ends on November 2001). May The consulting service for foreigners living in Japan begins. 1999 Jan The organization name is changed as International Volunteer Center of Yamagata (IVY). Jun IVY is approved as a specified nonprofit organization by Yamagata Prefecture. Jul Agricultural support project for women’s associations in rural villages in Svay Rieng Province, Cambodia begins. 2000 Apr Medical aid begins in East Timor (ends on March 2003). 2001 Jul Activities to nurture grassroots veterinarians and animal husbandry consultants begin (ends on June 2003). Dec Assistance for educational issues of children from abroad begins. 2002 Apr Literacy Education Project in East Timor begins (ends March 2003). 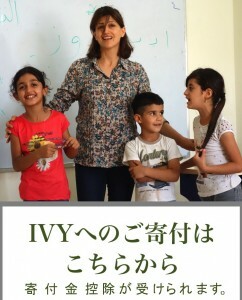 May IVY becomes a counselor for NGO assigned by Ministry of Foreign Affairs of Japan. Sep Saturday Class, supplementary lessons for children begins. 2003 Sep The 1st Global Cultural Festival is held (ends in 2009). 2004 Jul The symposium, “Educating and Accommodating Children” is held. Dec Symposium “Education and adaptation of children from abroad” is held. 2005 Aug Lecturing an intensive summer course begins on education for international understanding at the Faculty of Literature and Social Sciences, Yamagata University as a teacher-training course (ends in 2011). 2006 Jan The 1st Global Children’s Camp is held. 2008 Jun IVY is approved by the Director General of the National Tax Administration Agency as an authorized Non-Profit Organization. 2010 Apr The department of “IVY Youth” is established. 2011 Mar The Tohoku Disaster Relief NGO Center is established and activities begins. Apr Ishinomaki and Kesennuma sub-office are established. (closes on March 2012). 2012 Aug The name is changed as Approved Specified Non-Profit Organization IVY. Sep IVY Nursery School begins with operating (closes in March 2015). 2013 Feb Poverty Reduction in Rural Area through Establishment of Sustainable Management of Svay Rieng Agro-Products Cooperative in Cambodia is launched. Apr IVY becomes a member of Japan Platform (JPF). Support for Syrian refugees in Kurdistan Region in Iraq is launched. 2014 Mar Education Support for Syrian children in Kurdistan region, Iraq is launched. Nov Support for Internally Displaced People in Iraq is launched. 2015 Mar Education Support for internally displaced children in Iraq is launched.